Our newsletters have always discussed our offerings, viz. coffees, products and events. While this is great, our passion for all things coffee does not come through in these newsletters. So every time we have news from now on we will make an effort to have something that is more informational, that will have relevance to the rest of the news. This will mean those that are just interested in coffee can also get benefit, without having to feel the newsletter is driven by marketing language. So this newsletter will start with a discussion on how the coffee system works in Ethiopia, or how coffee actually gets out of Ethiopia. Then there is an update on our range and an introduction of a new concept we are working on. It will make the newsletter a significantly longer, but we hope you prefer this format, and anyway we only produce a handful a year. We are always try to improve our offering, looking at the coffee we like least in our offering and tasting coffees, either from the same origin or a different one to replace the coffees that no longer excite us. So get a cup of Quaffee and settle down to read. Ethiopia has the oldest coffee culture in the world. Although Arabica coffee has its roots traced to Southern Sudan and Eastern Ethiopia, it is widely accepted that the Ethiopian’s were the first to consume coffee, probably originally as a fruit but then the seed in animal fat, and eventually roasting or toasting it. Ethiopia is a large land locked country (only slightly smaller than South Africa, 1.13 million km² vs 1.22 million km²). Like South Africa it has diverse geographical subregions, from dry sandy desert in the north (lake Tana, the source of the Blue Nile, is in the northwest where the river flows south and then towards Sudan before heading north to meet the White Nile) to the lush tropical jungles in the South West. Most of Ethiopia comprises of mountain ranges, plateaus and high valleys between these mountains. It is the only country that was never colonized and has over 80 different languages of which Amharic is predominantly used. A large portion of the coffee produced in Ethiopia is consumed by the local market, making them quite unique as a coffee producing country. There are more Arabica varietals in Ethiopia than in the rest of the world. They are normally just grouped together as either typica or heirloom varietals. Most farmers are small lot farmers, some just pick from the forests. Large estates exist but most of them are state owned. While Ethiopia is only the fifth largest producer of coffee, and the largest in Africa, it is the third largest producer of Arabica. Ethiopia and Colombia are widely regarded as the two most preferred origins when it comes to coffee. They are the only origins that Quaffee always has multiple coffees from. 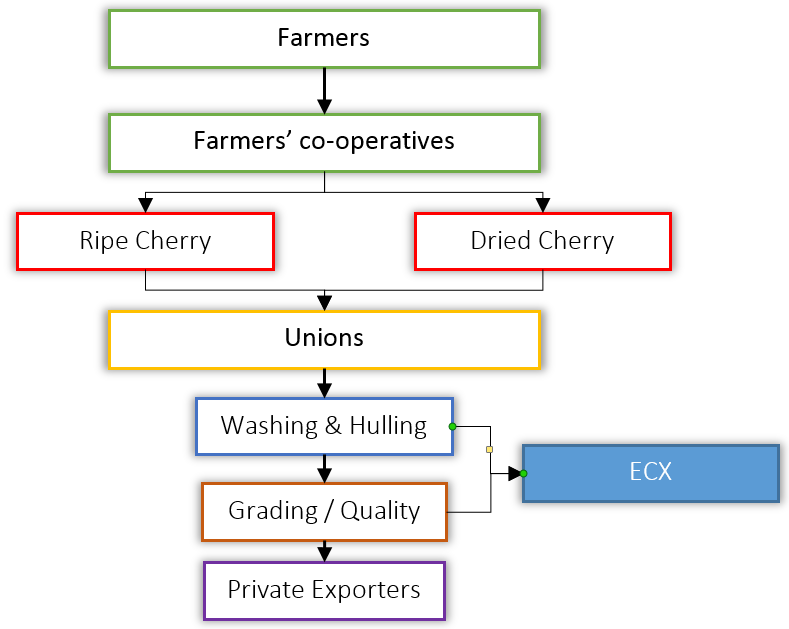 The major advantage for the ECX is to protect the traditional farmer by providing a single platform for all produce to be sold. The major problem is that although the ECX knows all the details of the coffee, it is designed to sell all commodities, not just coffee. As a result important details like where the coffee comes from, is not released to the purchaser. Also, most importantly, beans from high quality growers and regions or processing plants are not singled out even though it can be cupped the day before, it is just sold as a commodity, graded normally on size and shape, like all other commodities. Traditionally we have had no choice but to purchase Ethiopian coffees that were originally sold using the Commodity exchange. As you can imagine we would prefer to purchase using a method that reflects coffee quality, and gives back properly to the grower and producer that is driven by quality. 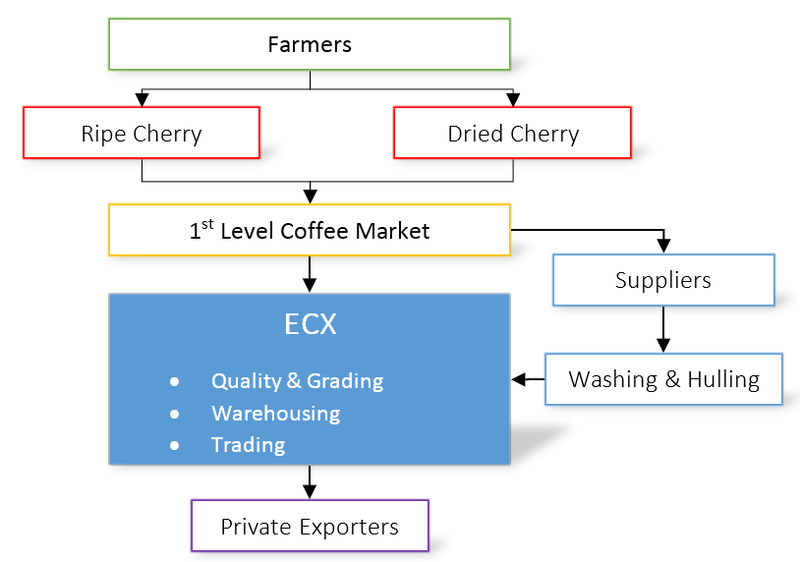 In 2010 under the ECX there is a newer coffee specific solution called the DST (Direct Specialty Trade) auction, which sell traceable coffee via the ECX. So far very little coffee is sold this way, but we have gotten access to some. The main difference is that the unions have a vested interest in producing higher quality coffee, since then they will sell it to the Private Exporters. If they are not producing a quality product that can demand top dollar then the coffee just ends up back in the ECX system. As far as Quaffee is concerned we are driven to purchase as much coffee as direct as possible. We want the quality of the coffee we source to always improve. This means that for us we a driven to work with systems that give us traceability to the farmer, so we can be assured of the quality, and reward it financial. Yes we taste the coffees first, but we have learnt over the last almost decade that the best coffee is traceable. The logic is simple: if the coffee is to be bought as direct as possible, traceability is a requirement. And traceability means accountability and this drives quality. This means, as far as is possible in Ethiopia, we would prefer dealing with Exporters that deal with the Unions or the new DST system. We have already had huge success with the Yirga Cheffee that we were able to source directly earlier this year, and now we are happy to say that we have two more coffees we are getting using this system. The results have been mainly positive, with about 5% of our clients preferring the old style that we used to offer. We suspect that this has been due to the packaging and bulk blended nature the ECX uses, which tends to result in a more undistinctive pre-blended taste. For those that like last year’s crop to taste like the years before and the years before, this is a way that this can be achieved. The ECX packaging has traditionally used the old simple hessian bag with no extra seal between the coffee and the world, so that when the coffee travels the most volatile compounds in the coffee are naturally diminished. This has convinced us to invest in the higher quality products, when we can. At the moment we have 3 coffees in the older style hessian bags. And one of them we are replacing with the new style higher quality product, Limu. We have a number of new coffees, some on their way and some just about to be released. New Microlot – we have a new microlot to replace the Franco Garzon. Also from Colombia, this one comes from Jaime Casallas, and it represents the best pickings of 2014’s crop on Finca El Prado which is based in the Huila Department in Colombia. It is a great coffee and since we only have 35kgs of this so we expect it to go fast. Brazilian Yellow Caturra – We have done the Sertãozinho for almost three years now. We were unable to secure this year’s crop so we were looking around for a Yellow Bourbon we felt was as good if not better. We believe the Brazil – Fazenda Pântano – Paraiso – Pulped Natural suited us well. This will be the first of the new releases to make it on to the offering list. Coffee from Cuba – We will release this in September. This is the first coffee we have ever offered from Cuba, and we were relatively impressed with this coffee. We have a single bag on its way, and full details will be available once we have developed a roast profile we like. El Salvador Santa Leticia – To replace our current Las Delicias from El Salvador we selected the pacamara from Santa Leticia, it will probably only be available towards the end of the year. Ethiopian Guji Liya – We have never done a coffee from this region of Ethiopia, when we tasted it we just had to have it. We only have 2 bags and it will only be available as a single origin. Ethiopian Limu Konjo – We are finally getting a Limu we are happy with. We have been fortunate enough to be introduced to Falcon specialty coffee, which have amazing direct contacts with the producers. This Limu comes direct from Woreda in the East Welega zone of the Oromia region of Ethiopia. The coffee comes via the DSP model and is fully traceable. It is called “Konjo” which means beautiful in the local language. Once this coffee arrives we will no longer offer the older bulk ECX Limu. One of the coffees we also have on its way is our very popular Decaf. We used to sell 90kgs of decaf a year, since offering the La Serrania, our decaf sales have tripled. A natural processed decaf processed at source is rare, and one that tastes as good as the La Serrania is even rarer. The Bunna blend is on its 6th generation. The blend consists of 4 of our best African coffees. Currently the blend is a good deal, with only one of the coffees being a three star complexity coffee. With the new Limu coming the coffee will be a four star complexity blend and will therefore increase in price. However it will really be the best of Africa we have. We will be introducing another entry level blend to take in the price bracket Bunna used to be. The new blend will be called Changanya (which means blend in Swahili), and will have one of the quality Africans, and two other coffees that come in the traditional hessian bags. Geoffrey Brink has joined us and he will be running brewing labs / training. We will be doing 1 hr labs on a single brewing method on week days or week nights (depending on demand). They should start in September. Drop us a line if you are interested in attending. We are now open on Saturdays at Buitenverwachting from 10:30 until 13:30. The information in the section about of Ethiopia is a collection of particulars from conversations with Mike Riley from Falcon Specialty coffee (where the new Ethiopians are being sourced from), documents available on the ECX website, an article on Ethiopia coffee published by William boots, and information expressed in Has Bean pod casts from Steven Leighton. General information was also provided by the ICO web site and Wiki for the geographical information. Thanks once again for reading the newsletter and your fantastic support, your support has enabled us to offer great coffee to you and fellow coffee lovers.